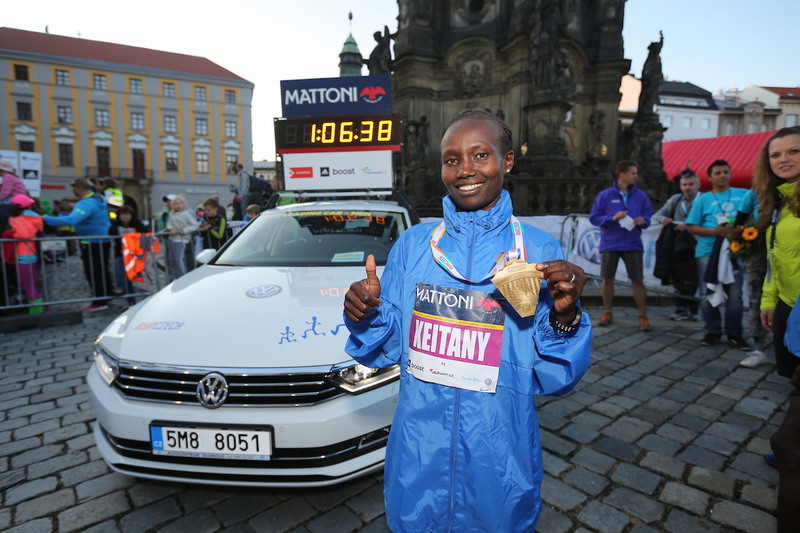 Mary Keitany emerged triumphant from the sixth edition of the Mattoni Olomouc Half Marathon, running the world class time of 66:38 for victory. The Kenyan improved the course record by over two minutes and achieved the fourth fastest time in the world this year for the half marathon. Her compatriots Rose Chelimo and Angela Tanui finished second and third with 68:33 and 68:41 respectively. The outcome of the men's race overturned pre-race expectations: the 21-year-old Josphat Kiptis produced a splendid performance to leave a world class field in his wake, winning in a personal best of 60:21 which was only four seconds outside the course record. His fellow Kenyans Jonathan Maiyo (60:32) as runner-up and Cosmas Birech (61:21) in third place completed the podium. The leading contender and former world record holder for the marathon Wilson Kipsang trailed in fifth with 62:09 and the Olympic Marathon champion Stephen Kiprotich of Uganda finished tenth in 63:07. This latest edition of the Mattoni Olomouci Half Marathon attracted 5,500 entries and the race is and IAAF Gold Label event. Olomouc is rapidly establishing a reputation as a place where surprises can happen, especially for previously little known athletes keen to make a breakthrough. A year ago the Kenyan Geoffrey Ronoh caused a sensation in beating his big name compatriots Wilson Kipsang and Dennis Kimetto. This time it's Josphat Kiptis who is garnering the plaudits in an action-packed Olomouc. Kiptis, who runs in the colours of the RunCzech Racing Team of the organisers, not only left Wilson Kipsang and Stephen Kiprotich far behind but also a further seven runners with faster personal bests before the start. Kipsang was unlucky as he suffered of stomach problems and had to vomit during the race. "I knew that I would be facing a former world record holder and an Olympic champion among my rivals. But I feared no-one because I had prepared very well," said Josphat Kiptis, who consistently forced the pace from the front. After eight kilometres Kiptis together with Birech and Maiyo had pulled clear of their impressive rivals. The trio stayed together for a long time before first Birech lost contact and then, two kilometres from the finish, Maiyo could no longer match the newcomer. "I'm delighted to have set a personal best," said Kiptis, who was running only his second half marathon and won a bronze medal in the 10,000m at the 2013 African Junior Championships. Mary Keitany almost missed the train which took the elite runners from Prague to Olomouc on Thursday, but for RunCzech's international race co-ordinator Jana Moberly keeping a door open so the Kenyan could jump on the train. But she found her timing to perfection when it came to the race. Thousands of spectators lining the route on Saturday evening saw Keitany put on a show of the highest class. The 33-year-old dictated the pace from the start and had a clear lead after just a few kilometres. After a terrific early pace – the 5 km split of 15:16 was on course for a world record – Mary Keitany slowed somewhat but still increased her lead to run a high quality race. Paced by her husband Charles Koech, she finished fast behind a number of men runners and improved Edna Kiplagat's course record by a huge margin of 2:15 minutes. "It was a great race, I enjoyed it," said Mary Keitany. The former World Champion and world record holder for the half marathon will now return to Kenya and decide which race she will run this autumn. "I'll do races between September and November," said Keitany, who was clear about her chief objective: "I want to win the gold medal in the marathon at the Olympic Games in Rio next year." The athletes finishing second and third in Olomouc also produced fine performances: Rose Chelimo only missed her personal best by eleven seconds with her time of 68:33 and Angela Tanui ran her fastest ever with 68:41. Their fellow Kenyan Helah Kiprop also deserved high credit to break 70 minutes with 69:25 in a race of such pedigree. 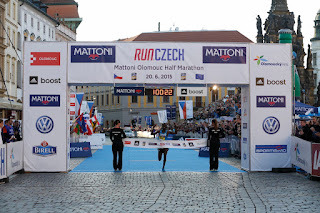 #olhalf #olomouc half RunCzech every splits each 5k for top men and women ! !